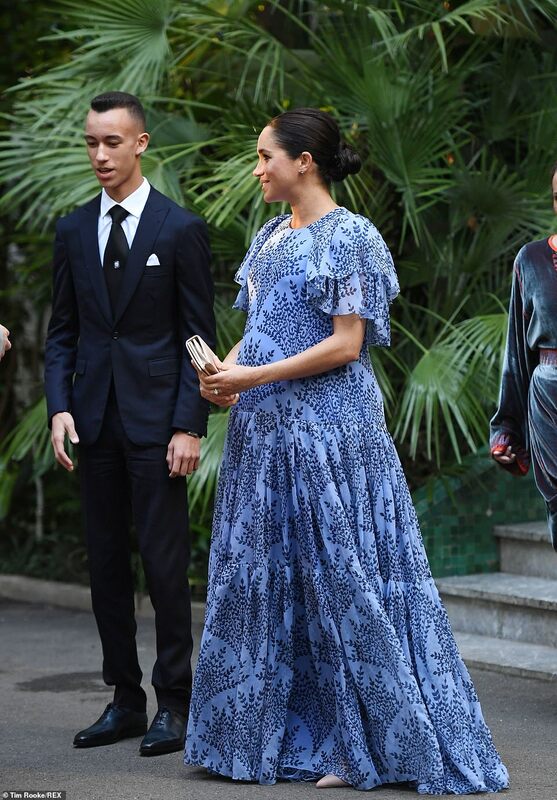 The Duchess of Sussex stunned in a custom Carolina Herrera gown as she joined her husband for a meeting with King Mohammed VI on the last night of the couple’s Morocco tour. 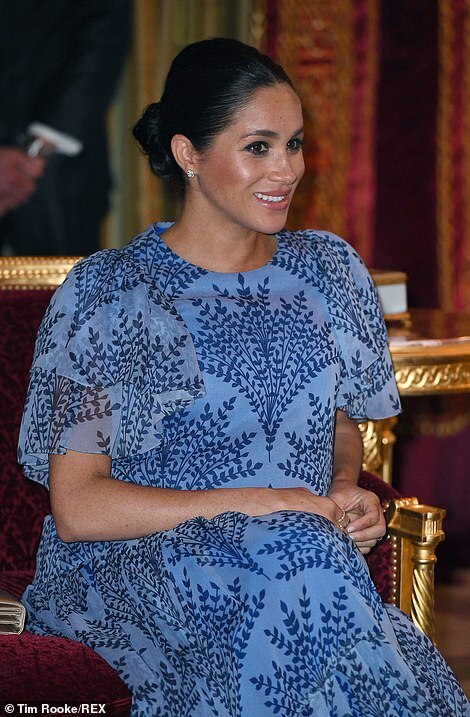 Meghan, who is around seven months pregnant, wore a flowing blue dress with frilled sleeves at the monarch’s residence in Rabat on Monday evening. It is believed to be a custom version of a £3,222 chiffon gown from Herrera’s AW19 collection. Featuring a flattering crew neck and a fitted waistline, the show-stopping dress with flared short sleeves is by a designer favoured by Queen Letizia of Spain. There was no sign of the King’s wife Princess Salma, despite having natural common ground with Meghan as a keen supporter of women’s rights. Dubbed Morocco’s ‘missing princess’, Lalla Salma, now 40, has not been seen in public since the end of 2017 when she visited the Mohammed VI Museum in Rabat – and there has been endless speculation surrounding her whereabouts. Some believe the mother-of-two has divorced from King Mohammed and is being hidden in Morocco, while others think she may be living in exile in the US, or on the Greek Island of Kea with the couple’s youngest daughter, Princess Lalla Khadija, 11. 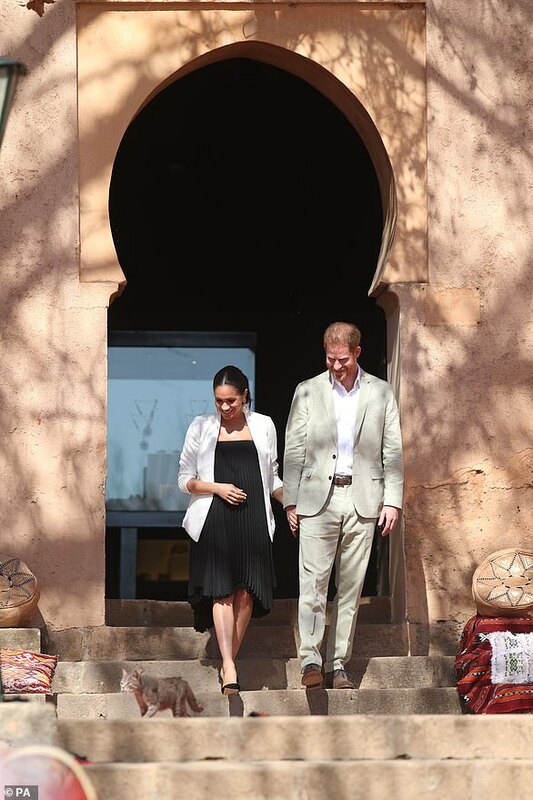 However, the palace has never confirmed the couple’s rumoured split and the Moroccan media has reportedly chosen to ignore the princess’ disappearance from public life. 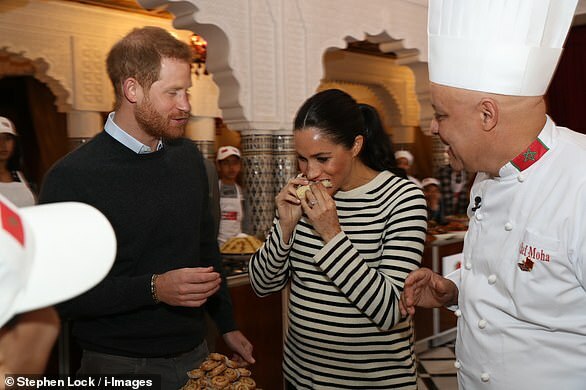 Plans for the Duke and Duchess of Sussex to make a return trip to Morocco appear to be in the offing after Harry said they would come back and ‘keep it very quiet’. 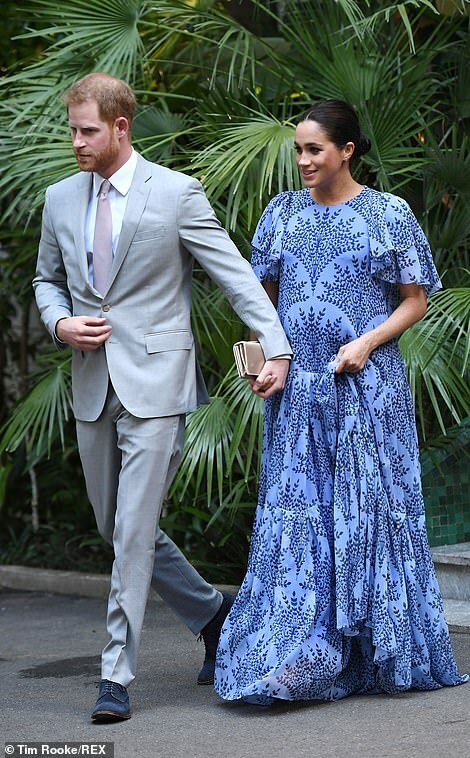 The couple ended their three-day tour by spending around an hour with the king at his private residence surrounded by his immediate family – with the duchess making her third outfit change of the day. 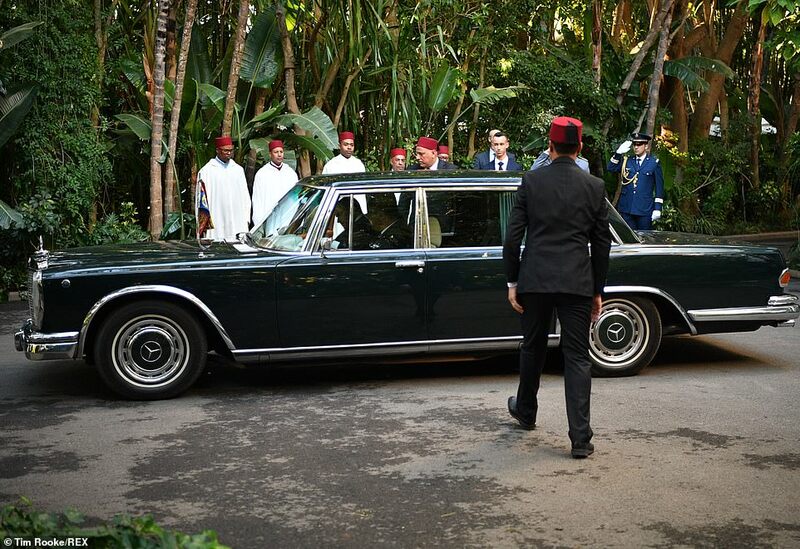 But it was more like a get together with friends with the 15-year-old Crown Prince Moulay Hassan greeting the couple outside the door after they arrived in the King’s vintage Mercedes 600 SEL, loaned to the couple during their stay. 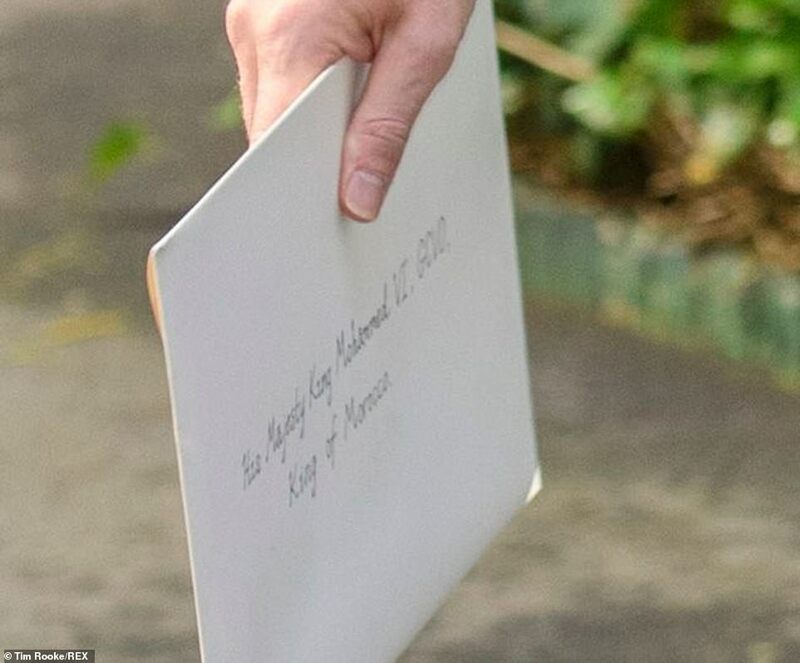 The head of state was all smiles in the doorway and Harry and Meghan both complimented his home which featured an ornate internal courtyard behind the monarch, richly decorated with Arabic designs. 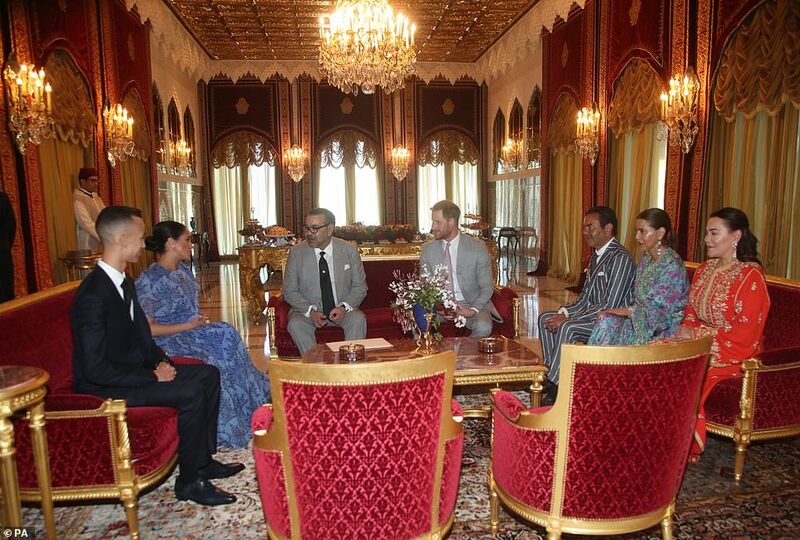 In a side room the royal party sat down with the Crown Prince joining Meghan on a sofa, Harry and the King nearby on another, and on a third sofa the monarch’s sisters Princesses Meryem and Hasna and his brother Prince Moulay Rachid. Earlier the couple visited he Social Entrepreneurs event and market in the Andalusian Gardens in Rabat. 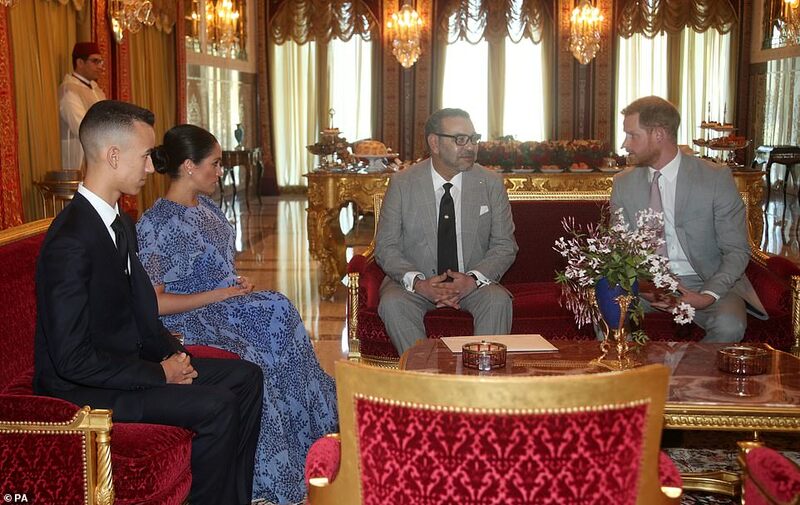 The Duke and Duchess heard about youth empowerment in Morocco from a number of young social entrepreneurs. 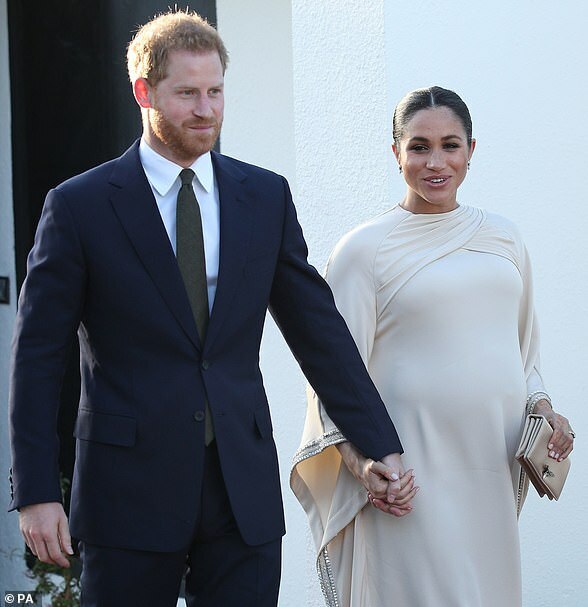 Meghan and Harry arrived hand in hand at their third engagement on Monday morning, having put on a very tactile display throughout the day. 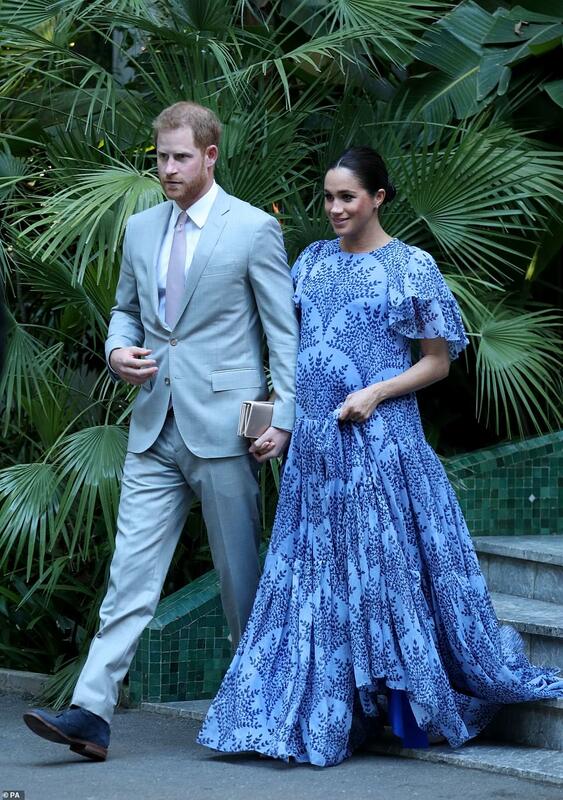 The parents-to-be were seen admiring the traditional Moroccan arts and crafts on display in the walled public garden amid exotic plants, flowers and fruit trees. 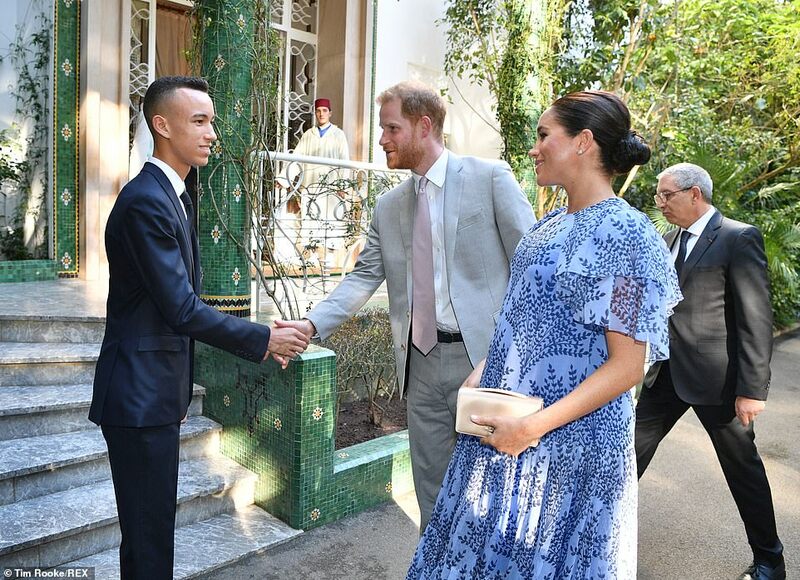 During their stay in Morocco, Harry and Meghan have already met the couple’s son Crown Prince Moulay Hassan, 15, who is one of the ‘richest teenagers in the world’. 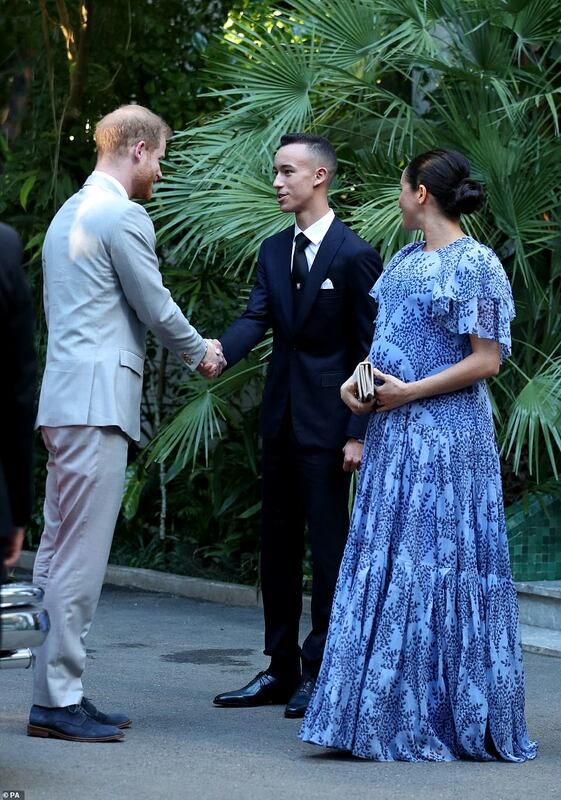 It is thought to be the first time that the British royal family have met the future monarch of Morocco. The Duchess, who has made women’s empowerment a key part of her work, has discussed issues facing women during her trip. She had a conversation with Meriem Bensalah, chief executive of finance and agricultural firm the Holmarcom Group, who told her that Moroccan women had made great advances towards equality but still faced disadvantages. 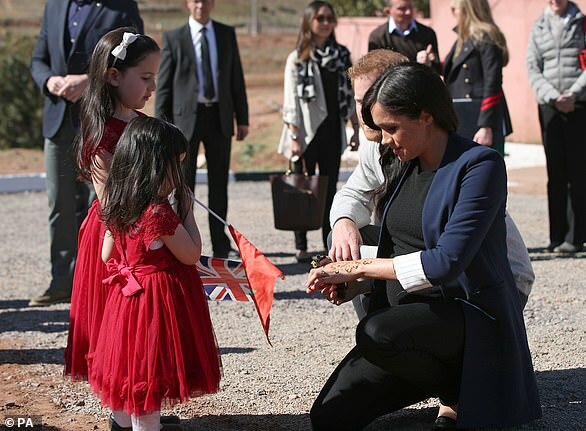 The Duke and Duchess of Sussex also traveled to the town of Ansi in the foothills of the Atlas Mountains to visit a secondary school and meet pupils on Sunday morning. 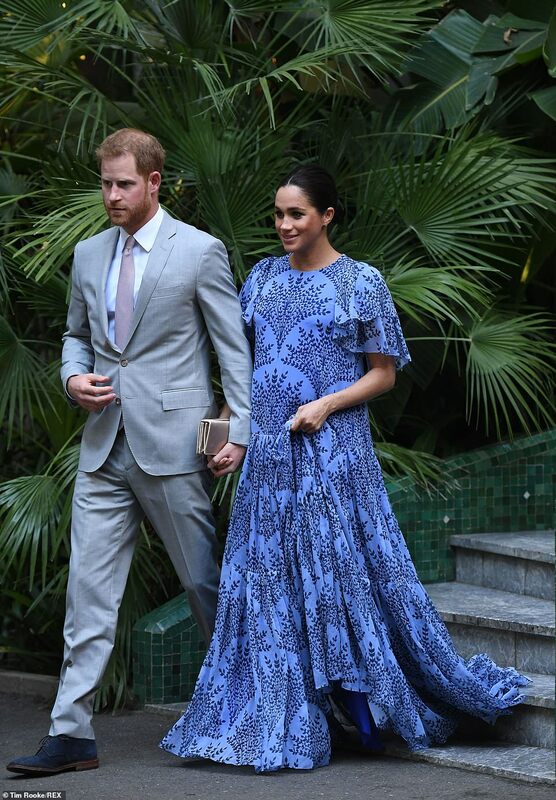 Last night saw Meghan pull out all the stops in a in a sweeping kaftan-inspired Dior gown as she joined husband Prince Harry for a reception at the British ambassador’s residence in Morocco. 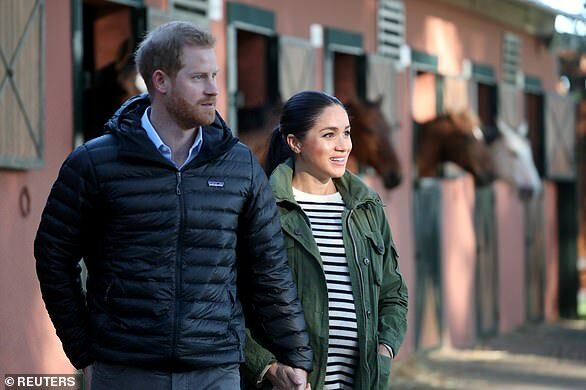 The royal couple, who are on a three-day tour of the North African country, spent Sunday evening mingling with captains of industry, military officers, disabled athletes and young business leaders. The evening event was hosted by British ambassador Thomas Reilly and his wife Leah at their official residence in the capital of Rabat – a city which has been rocked by riots in recent days.